ClueCon is described as “a conference for developers by developers: an annual technology conference held every summer hosted by the team behind the FreeSWITCH open-source project. Our primary focus is to gather various open source projects to discuss Voice over IP, open-source software and hardware, Telecommunications, WebRTC, and IoT. We sit at the intersection of communication and technology and we love all things technical.” ClueCon was held July 23-27 in the Swissotel, Chicago. Casarrubios, Alvaro Gomez Hernandez and Don Monte. 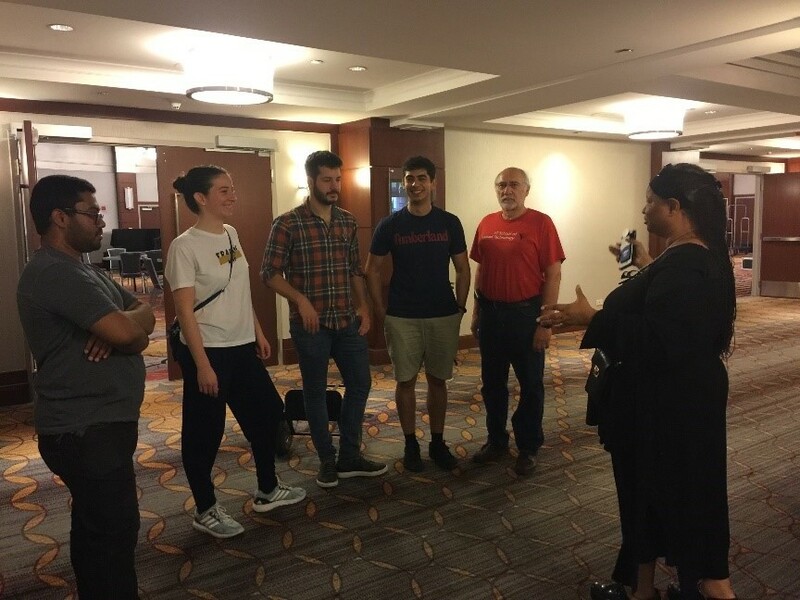 Sharon White of ClueCon is shown giving volunteers their instructions for setup on Sunday, July 22. IIT Lab students together with professor Carol Davids presented an all-web solution to emergency calling using a smart phone application that provides its indoor location to a WebRTC-based Public Safety operator. 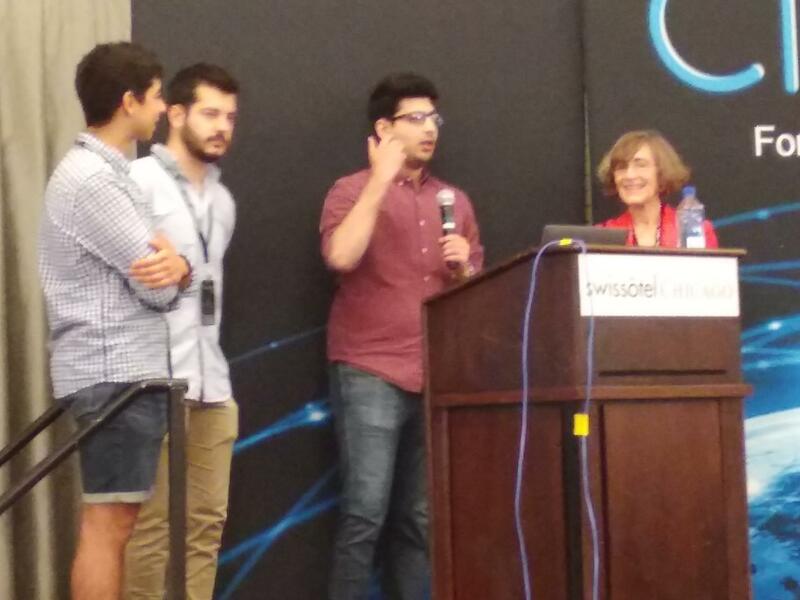 From left to right, in the photo below: hackers: Alvaro Gomez Hernandez, Jose Luis Martin Casarrubios: Presenters: Shahzil Sheikh and Professor Carol Davids. The students who participated in the hacking events competed in several of the coding challenges and won two prizes. Jose Luis Martin Casarrubios won the 'Makers Challenge' on Monday the 23rd for the 'Most Impressive Project.' The challenge was to make a dumb object smart. Jose built a smart bin. The smart bin knew when it had trash to throw away, and after throwing it away the bin calculated how filled it is and displayed it in 3 LEDs red yellow red. 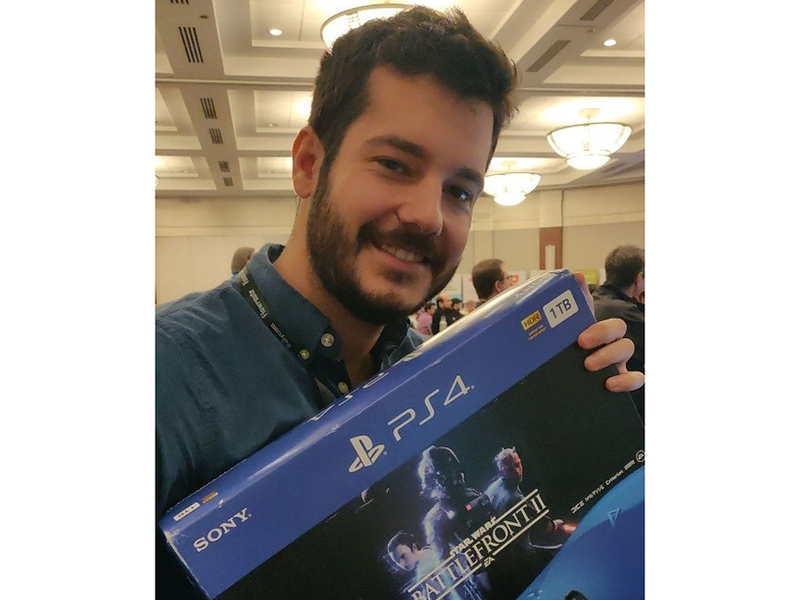 Later in the week, Jose also won the Cloud API Challenge by SignalWire. He developed a multiplatform application for indoor location. The project scanned for beacons, sends the information to the Real-Time Communication Lab's BOSSA platform and then, using the Signalwire cloud api, it called the emergency services with an automated message with the indoor location and sent an SMS message to a family member with the indoor location as well. Each year ClueCon hosts a hilarious event called 'Dangerous Demos'. While we did not win a prize in that event, Alvaro Gomex Hernandez did compete, demoing - in 3 minutes - an application that makes Alexa call 911 and delivering a customizable, pre-recorded message requesting help. This project will be continued in the lab this fall. By far the funniest dangerous demo was provided by FusionPBX. This two second video shows the audience playing volleyball with a bubble-wrapped Raspberry Pi that is running the FusionPBX, while the PBX is being configured and used to make calls! This is not your grandpa's PBX!